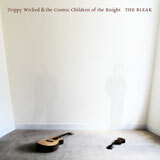 Trippy Wicked and the Cosmic Children of the Knight…or Trippy Wicked as I prefer to call them to save rubbing all the letters off my keyboard…are one of Britain’s foremost and finest purveyors of monolithic Sabbathian riffage and monster grooves…except on this release. Being the modern day renaissance men that they are they have metaphorically thrown their keys into a musical wife swap and done a musical 360 of dizzying proportions. Somewhere along the way bassist Dicky has been made to sit in the corner and eat cake while drummer Chris has put down the tree trunks he normally hits things with and picked up an acoustic guitar while guitarist/vocalist Pete has picked up a ukulele. Fear not though folks, this isn’t a whimsical take on George Formby but rather a stripped back acoustic driven exploration that draws on a 20 minute sludge epic that the band have yet to unveil. “The Bleak” is an apt title. This is certainly no camp fire style sing-along as all 4 tracks are instilled with a fragile beauty and restraint that is more intense and emotional than their amplified work. Over the course of nearly 13 minutes you can almost hear their hearts breaking. Given the bluesy base that lies at the heart of the usual doom driven outings I was expecting this to spring from the same source but it seems the shift in instrumentation also shows a shift in influence as Chris’s playing betrays a far more folksy finger picked kind of style that wouldn’t be a million miles from Bert Jansch or Pentangle. Pete’s high end vocals have been tempered into a more wistful and mournful croon that reeks of loneliness, rejection and despair…and he’s always seemed like such a happy guy! Chris’s guitar really lies at the heart of the music here with Pete’s ukulele touches serving to add highlights rather than drive the songs. “Restless” also features some subtle touches of piano and on “Separate Paths” Pete breaks out his horn to help add the final strokes to the picture. Recorded by the band in a home studio, this really does have an intimate and claustrophobic quality to it. Not only have they captured the vibe in the melodies and the lyrics but sonically this almost feels as though the band are in your head…they’re not in the room trying to capture your attention and entertain, they’re within the confines of your cranium giving you the bitter truth about life. This is a brittle and beautiful release from the band that sets them apart as one of the most versatile bands around in the UK underground scene. 4 tracks is about right as well, emotionally I don’t think many people would be able to deal with a full album but this is as perfect as this release could be.